No, I'm not lost at sea...I'm here still! Normally no updates = nothing going on to update about...not exactly true around our house. I think the truth would actually be too much going on to stop and update my blog! So what have we been up to? Glad you asked. Spring has finally sprung, so what do I have? Spring Fever! The only problem is it started in February, maybe a little too early. Spring breakers raided our beach the end of February, but along with the spring breakers came MTV and others for concerts on the beach. Jake and I got to go see Kenny Chesney, up close and personal, at Spinnakers one afternoon. Way fun and way cool! He played for 3 1/2 hours, and I loved every minute of it! The next day we saw Lil' Wayne on the beach, and he performed too. It was fun...total opposite kind of music from the day before! So that trip down to the condo was suppose to be 2 days...we ended up staying 8!!! Dad brought the kids down to us that weekend and we stayed on more days. LOVED it! School was calling the kid's names, so we eventually came back to GA. Well, I came for a few days.. the beach started calling my name, so I answered the call! A few trips back and forth, some racing mixed in (oh yeah, the season has started!!! GO 98! More about that later...), and the kid's week off for their spring break...needless to say, I have been in Florida more days the last month than I have been in Georgia. At least you know I'm still alive, I'm still my beach-obsessed person, loving life, and having as much FUN as possible along the way! Laying in bed late one night last week, Jake says, "Want to go on a cruise tomorrow? ", which I then reply in a sleepy state, "What, no you won't take me anywhere!". I went off to sleep, but woke up the next morning remembering what he had asked me. Was I crazy the night before??? Of course I want to go on a cruise!!! I quickly got online and started looking at some options. Jake already had a few options picked out, so we pondered our decision that afternoon. That night we booked our trip, along with Levi and Leah, and headed toward Miami the next day! 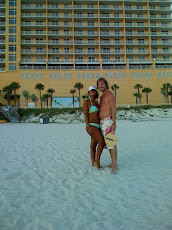 WooHoo, warm weather, sunshine, and my sweetie by my side! We had a fabulous trip! Nice ship, good food (just too much of it), great friends to laugh non-stop with, hot sun, warm sand, dancing...what more can you ask for?!? We spend one of our days at Atlantis on Paradise Island...YES this is paradise!!! I already knew what a paradise it is, but now I've ruined Leah! She won't sleep well again at night until she has her trip back planned, and specifically to be able to spend day after day chilling at the Cain pool! Love, Love, Love it! It's me! Hello...it's already halfway through February? Where has the time gone?!? It's been busy around the Carswell house. School for one thing, work, conferences, and of course some fun mixed in too. We enjoyed a trip to the Bahamas to escape the cold, winter weather in January, and had an absolute blast! Jake was busy with the annual Men's Conferences at FBCW for 2 weekends! Wow, never seen so many men all together at one time! The kids have had practices for Kidzplace 2 times a week for the last month, and are excited to have had one of their performances this past Sunday and more this next weekend. Of course we've squeezed in some trips to PCB in the middle of it all...can't stay gone from there too long. Today we have enjoyed a school holiday and really not ready for it to end. Zumba class this morning, yummy lunch, skating and laser tag, hanging out with friends...soooo much fun! That's a little taste of what's going on around here. I'm going to try to get better about updating more often...if there's anybody out there who even notices!!!??? Some comments from you might help me along....Helloooo are you still there??? Talk to you soon! Now it's back to "normal routine", whatever that might be! I know for now it's school, getting my house back together and un- Christmasized (new word), and trying to get back to my work-out schedule (ughhhhh, I love to do it once I start, just starting is my problem...any takers on going to the gym with me???). Have a fabulous week! Hope You Had Yourself a Merry Little Christmas! Merry Christmas from the Carswell crew! So what!?! Yeah, I know it's past Christmas, almost New Years, but I'm behind and I'm catching up! We hope yours was great...ours was! We had a festive time hanging out and chilling with family and friends. There were some fun times and events during the holidays that I should have posted and filled everybody in on, but so much else has happened since then that I can hardly keep up and remember it all. All the fun memories are in my heart, hahaha cheesy! "Santa" came and visited everyone in our house! Hope you were nice and not naughty so he stopped at your house too! CC got a electric guitar, so much for peace and quiet around my house! Hahaha. KC, little miss diva, was excited about a new cellphone, and both kiddos loved their new Ipod touches. We all were excited about our gifts, but the most important gift of this season and seasons past is the birth of Jesus...don't forget that! It finally happened...the Carswell family, aka Griswold family, found, bought and decorated a tree! Yes, Dec. 12th, later than usual, but nevertheless it was up and finished! Tree #1 shown here out of the 4 that eventually made it into the home before the 25th. Ahhh, one accomplishment down...too many to go! Have fun! That's what we try to do every day. Whether we're at home with not much going on (doesn't happen all that often), at our favorite place...the beach, at some race track, or wherever we may be, we are making memories. We live a busy life! We love the life God has blessed our family with. We love all our family, our great church, our sweet friends, and Jesus. We have one major hobby, RACING! We also have a major obsession, the BEACH! Thanks for stopping by. Leave us a message and we'll stop by your place sometime too! It's A New Day, Inc.